NWA Mid South presents “Legends and Lions”! 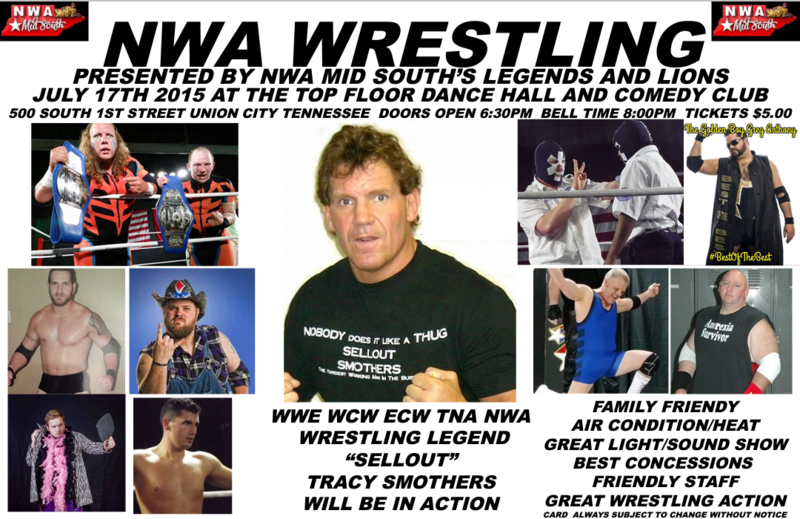 Home / NWA MIDSOUTH / NWA Mid South presents “Legends and Lions”! NWA Mid South, @NWA_MidSouth on Twitter, presents “Legends and Lions” as we invade Union City, TN this Friday night, July 17th. The matches will take place at the Top Floor Dance Hall and Comedy Club, located at 500 South 1st Street in Union City, TN. The doors open at 7pm with an 8pm Bell Time. “The Wild-Eyed Southern Boy” Tracy Smothers vs Van “The Man” VanHorn! NWA Southern Heavyweight Champion @NWAGoldenBoy Greg Anthony vs Chris O’Neal! Don’t miss the first expansion of NWA Mid South Wrestling!